The trap is the ideal set and forget trap. Simply set it where the stink bugs are and let it get to work. Perfect for the solitary pest. Works especially well in gardens. Ideal for persistent pest problems and larger infestations. Finding pests in your home is frustrating and gross, but finding pests in your home that release a stinking odor when disturbed adds a whole other level of gross to the occasion. The Brown marmorated stink bug is an invasive insect that infests homes in large numbers but is possible to trap and eradicate. The following are the top 3 best stink bug traps. Which Stink Bug Traps Should You Choose? Best used in areas like under sinks, behind toilets, and behind appliances. Easy-to-use, no-mess baits do not require activation. Cutter Combat Max 12 Month Roach Killing Bait was designed for cockroach infestations but works exceptionally well on the smaller, less resilient stink bug. 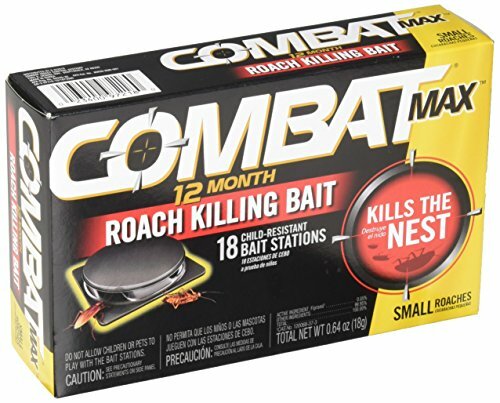 Cutter Combat Max 12 Month Roach Killing Bait wins the title of “Best Overall” stink bug trap of 2018 because it is the only tap on our list that actively attacks the source of the infestation. The stink bugs that are lured into the trap by the bait are covered in Fipronil, a broad-spectrum insecticide, which they then bring back to the source of the stink bug infestation, thus killing the entire stink bug population. What’s more, the Cutter Combat Max 12 Month Roach Killing Bait is a set and forget pest killing bait station. Simply place the traps under sinks, near corners and the source of the infestation and forget about them. Keeps you at a safe and comfortable distance while humanely removing the stink bug from your home. It isn’t an option for gardeners who are vegetarian or vegan. Will not work on larger infestations. Only effective on single pests. The My Critter Catcher Spider & Insect Catcher is a unique pest trap that enables owners to safely and humanely remove pests from their homes and gardens. 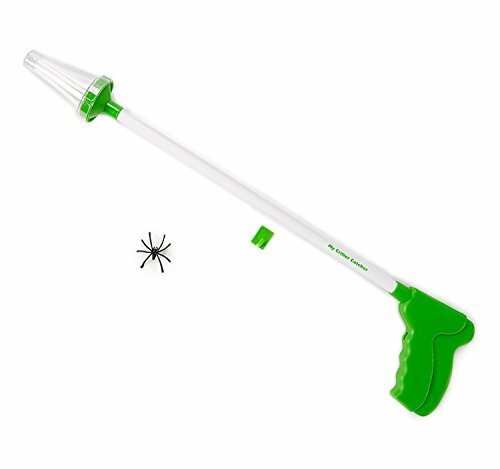 The personal bug, spider and insect trap includes a 26-inch handle and a soft bristle trap that safely surrounds and encloses household bugs and insects, so they can be released elsewhere. The number of bug traps that do not kill the insect is few, simply because most homeowners would rather eliminate pests as soon as humanly possible. However, what makes stink bugs different from the other common household pests is the offensive smell they release when crushed. My Critter Catcher Spider & Insect Catcher is included on the top 3 best stink bug traps because it enables the homeowner to remove the stink bug without killing it and releasing its stinky odor into your home. Eliminates Stink Bugs without triggering stink defense. Ultraviolet light that attracts and eliminates stink bugs. It’s no secret that bugs are attracted to light, that is why bug zappers are so effective. Stink bugs are no different; however, due to their swarming nature, a bug zapper isn’t the ideal extermination method to rid them from your home and garden. 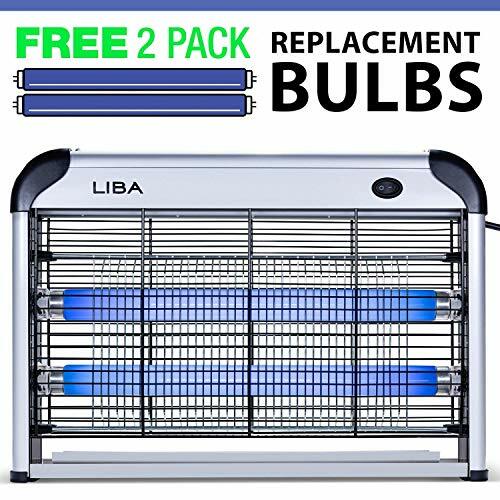 That is until the Bug Zapper Electric Indoor Insect Killer manufactured by LiBa. The Bug Zapper Electric Indoor Insect Killer is a set and forget electric fly trap that lures in pests and quietly exterminates them with a powerful zap. We like the Bug Zapper Electric Indoor Insect Killer because it does not include or require the use of poisons or harmful chemical agents to lure in and exterminate stink bugs. Bug Zapper Electric Indoor Insect Killer includes a UV light, so it is extra attractive to stink bugs without realizing potentially harmful toxins into your home. Furthermore, the Bug Zapper Electric Indoor Insect Killer eliminates stink bugs without releasing their trademark odor. Severe infestations of the home require a more powerful trap that can be utilized 24/7 after setting it. Ultimately the stink bug trap that you choose will depend on the severity and the location of the infestation. For eliminating stink bugs from your garden then the ideal trap is the My Critter Catcher Spider & Insect Catcher for its ability to catch and release insects without the use of harmful poisons that can ruin your garden. In this case, the ideal trap would be the Cutter Combat Max 12 Month Roach Killing Bait for its ability to eliminate individual stink bugs as well as the greater infestation without any more effort than it takes to set the trap in a corner. A bait station trap like the Cutter Combat Max 12 Month Roach Killing Bait is a powerful trap that can be set and forget, which makes it ideal for large infestations of the home. Bait stations typically utilize a combination of chemical agents and poisons that attract insects, then cover them in a delayed poison which they then carry back to their swarm, nest or hive. Bait station traps are affordable and easy-to-use. They require very little effort to set correctly. Simply open the package and place the traps in places frequented by the insects, in the case of stink bugs that means near exterior doors and windows. Bait station traps are also a reasonably long-term solution to a stink bug infestation. It takes a long time for the poison in each trap to be spent, this allows the trap to work effectively for several weeks or longer depending on the severity of the infestation and how many stink bugs trigger the trap. Lastly, bait stations are generally safe for use around children. The Cutter Combat Max 12 Month Roach Killing Bait trap is child-protected, which makes it impossible for a child to open the trap and expose the harmful poison. A handheld catch and release insect trap is a fun way to keep your home free of insects and bugs without having to kill or even touch them. Similar to an extending grabber used to pick things off of the floor, a handheld catch and release insect trap enables the user to grab insects by trapping them with the traps soft bristles and release them outside. A Catch and Release Handheld Insect Trap is easy-to-use and even safe for use by children. What’s more, there are no toxins or poisons involved, and no harm is done to the insect, the environment or your home. An indoor zapping house fly trap combines the insect killing power of an outdoor bug zapper with the quiet effectiveness of a poison insect trap. Though not as effective as a bait station trap, the UV light included in most indoor house fly traps attracts insects and quickly dispatches them without the use of harmful toxins or dangerous poisons. A zapping indoor house fly trap does exceptionally well at preventing a large infestation from gaining a foothold in your home. Continually utilizing the trap indoors enables the trap to regularly dispatch new insects and prevent insects from building a nest, breeding and ultimately spreading. A zapping indoor house fly trap will be the more expensive option amongst the various stink bug traps, but the peace of mind the provide offsets the extra cost.